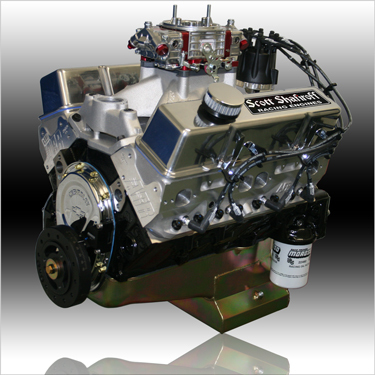 This Small Block Engine Provides Both The Power And The Sound That Screams "Hot Rod". Utilizing A Mild "Street Roller" Cam Profile And A 10.5 Compression Ratio, It Delivers The Tire Melting Power You Want And The Cruising Reliability You Need In A Pump Gas Friendly Package. (2) Composite Fuel Pump Rod Required with our custom camshafts. If This Fuel Is Readily Available In Your Area, Our E85 Version Offers Much Greater HP And Torque Numbers Over Its' Gasoline Equivalent. E85 Fuel's Ability To Operate Without Detonation Under Much Higher Cylinder Pressure Allows Us To Significantly Raise The Compression Ratio And Slightly Alter Cam Timing To Produce These Dramatic Improvements. You Must Run An E85 Specific Carb Or Program Your Aftermarket Fuel Injection To Work With This Engine. For Those That Want Virually All The Power Of "The Classic" Without The Hassle Of Ever Having To Adjust Valves, The HHR Is For You! We Use Special "Proprietary Grinds" On Our Custom Hot Hydraulic Roller Cam Along With "Ultra Hi-Rev" Hydraulic Roller Lifters And Premium Alloy Valve Springs To Maintain Race Engine Performance With Hydraulic Roller Convenience. The "Saturday Night Special" Package Is Designed For The Hot Rodder That Puts Performance Above All Else. It Combines "Limited" Streetability With "Race Engine" Performance In A Pump Gas Version! This Is The "Bad Boy" Of The Bunch! Putting Out Well Over 600HP, This Monster Requires Competition Drive Train, Chassis And Exhaust Mods To Deliver Its Maximum Potential. With Its More Aggressive Camshaft Provirtual And Slightly Higher Compression Ratio It Requires A Minimum Of 93 Octane Gas ... But That's A Small Price To Pay For The Incredible Performance That This Package Delivers!! Planning On Adding Nitrous? We've Put Together A Preferred Option Package Of Our Most Popular And Highly Recommended Heavy Duty Components ... With The Added Bonus Of Savings!! Total Package Value = $945 - Save $50!